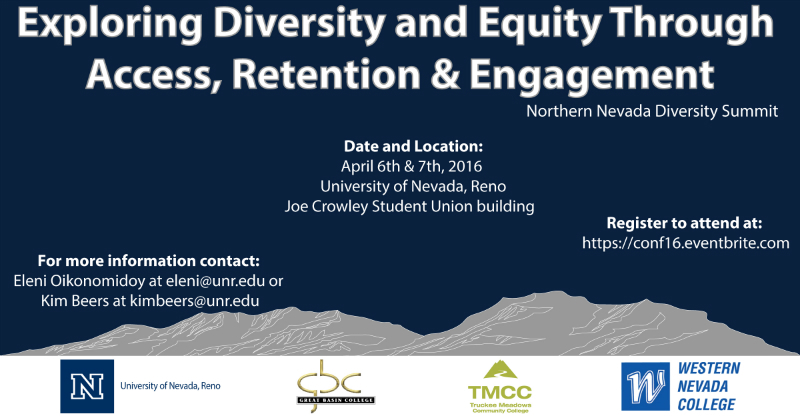 The Northern Nevada Diversity Summit titled “Exploring Diversity and Equity Through Access, Retention & Engagement” will commence within a two-day span at the Joe Crowley Student Union located on the University of Nevada, Reno campus. Starting Wednesday, April 6th, 2016 at 8:00 am and ending Thursday, April 7th, 2016 at 5:30 pm. This event is in its third year and is hosted annually by the Cultural Diversity Committee at the University of Nevada, Reno. The summit is expected to attract a total of 500 attendees ranging from higher education personnel, college students, K-12 personnel, community leaders and organizations within the state of Nevada at no cost to them. The summit will include a keynote, panel discussion, and a total of 79 presentations in varying formats (20 minute concurrent sessions, 30 minute roundtables, and 90 minute workshops). The goal of the Northern Nevada Diversity Summit is to publicize current research, share resources that are available, provide opportunities for networking and collaboration across disciplines/constituencies, highlight accomplishments and objectives, and identify existing needs as it pertains to diversity and equity. The summit is free and open for all to attend. Registration ends April 1, 2016.